“Never Give Up” by Jenny Maher is a powerful story of courage and survival. This memoir of a brave woman who suffers unimaginable challenges, and not only survives, but also maintains a positive attitude, sends a potent message for all of us to keep life in perspective. She also reminds the reader that each of us needs to be our own advocates and fight for we want and need. Ms. Maher’s struggles begin early in life, growing up with abuse in her childhood. She, along with her parents, suffered from mental illness, which exacerbated the abuse. The author shares her loneliness and depression that lead to suicidal thoughts and actions. She has a run-in with the police and ends up being shot in the face. While trying to recover, she is put in jail. Later, she finds herself a quadriplegic, paralyzed from the neck down, with no family or support to help her through this difficult time. 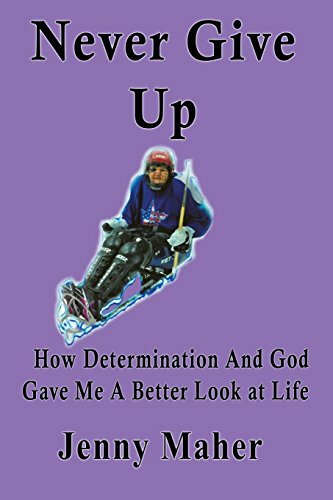 This book discusses in detail the struggles of paralysis, learning to find any kind of independence possible, and the mental battle of staying positive during the process. Ms. Maher turns to God, and finds peace through prayer. Her determination to gain independence is inspiring, and reminds me to keep fighting through my personal challenges, particularly when it is difficult to see positive results. While the story is incredibly inspiring, the book needs serious editing. The grammar, spelling, sentence structure, and word usage is very poor. It was clearly not edited prior to publication. I recognize that there are typos and errors in most books, but the lack of editing in this book is a significant distraction. I would recommend “Never Give Up” by Jenny Maher, once edited, to anyone looking for inspiration by someone who has been through obstacles most of us will never encounter, and still sees the good in life. Ms. Maher is a person for each of us to emulate, learning from her courage and strength, both mentally and physically. Thank you for sharing your story!